Today’s post comes to us from Hayden Kennedy about a climb he recently attempted with Jason Kruk. Anyone who’s paying attention these days is blown away by the progression. The talented youth just keep getting after it, and it’s not just in cragging and bouldering. The serious alpine has always attracted only a few inspired stragglers, and today’s story comes from one of the best. Hayden Kennedy has red pointed 5.14c, free climbed El Capitan, and he and fellow youthful badass Jason Kruk have summited Fitz Roy in burly conditions. Oh – and he’s just now old enough to go to the bars (in the U.S, that is – it’s only 18 in Canada). 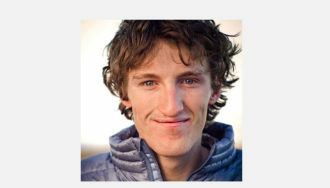 Here’s a great piece on a great face by two great young climbers. -K.C. “It’s just you and me and a big alpine face, this is what we came here for!” Jason Kruk says as we pack our bags at my van before embarking on an alpine-style push on the north face of North Twin. The North Twin is a beast of a mountain and it is one of the biggest and hardest north faces in the Canadian Rockies. The north face is about 5,000 feet and maintains hard climbing the entire way. It has only been climbed three times in 37 years and each of the three teams were leading alpinists at their time. George Lowe and Chris Jones made the first ascent of the north face in summer 1974; it was a groundbreaking route done in impeccable style. It would be another 11 years before alpine climbing legends Barry Blanchard and Dave Cheesmond established the North Pillar route, in perfect alpine style over four days in August 1985. Tales of horrendous rock fall, scary climbing and a long approach terrified people, and the face loomed over alpinists like a huge tidal wave about to crash. In April 2004 Steve House and Marko Prezelj made the third ascent of the face in mixed conditions; during the climb Steve dropped his boot shell, forcing Marko to rope gun the rest of the route. The stories and the legends of the North Twin make any alpine climber shiver just a little bit. Just a couple of weeks ago, after a call from Jason, I was totally jacked and packed my van for the 22-hour drive from Colorado to Canmore. Fueled by coffee, junk food and the audio version of Keith Richards’ new book Life, I pretty much drove non-stop, only to find that spring in Canmore was hardly spring but more like mid-winter. For the next week it snowed and rained so hard that for a moment I thought I was back in Patagonia. So we did what all Canadians are good at: drink! The bouldering world cup was in Canmore that week and Jason and I couldn’t believe the talent. We danced and partied, having no hope of going alpine climbing until good weather came. Thinking back to Life, I tried to pull my best Keith Richards and pick up three chicks at the same time. Didn’t quite work out. So it was time to do what we’re better at, or at least no worse: go climbing. The weather wasn’t ideal but we packed four days of food and gas and hiked about seven miles to the Alberta Hut. The anticipation before a big climb kills me. All I want to do is start, but I try to calm my mind and just rest. It’s harder than it sounds. I am slowly learning, though I think it takes time and experience before your mind is truly ready for routes like this. The mental game is far more challenging than physical exertion. We rose from a fitful sleep, and were out the door of the hut at 2:30 a.m. The night was clear and the Twin loomed above. We were psyched and this was what we came for, so we were in full “go mode,” ready for the experience. Jason started leading a runnel with thin ice and sparse protection. We gained a snow ramp and simul-climbed until we reached the next rock band. Jason continued leading broken mixed terrain until he got to a steep bulge of choss. “I am not really sure if this goes,” he yelled down to me. The next 30 feet was the proudest lead I have ever seen. Jason placed two knife blades that were a joke, and he went for it, climbing steep, hard, complete choss. I started up the next pitch on good rock with decent face climbing and hard mixed climbing, until we gained the huge snow field in the lower part of the face and simul-climbed for a very long time. Jason led a very committing pitch with hard dry tooling and many snow mushrooms. Progress was slow, and the climbing above continued to be hard and steep with poor protection. I can’t remember how many pitches we did that first day but we covered more than half the face. At the top of the last steep snow band we chopped a small ledge with only enough room for us to sit down. That night storm clouds rolled over the Twin and it snowed on us for a few hours. We felt exposed and unsettled, and then, in the middle of the night, the clouds dissipated into the starry night. Just before first light we brewed and racked-up for the final headwall. The climbing right off the bivy was a hard-to-protect thin knifeblade seam, and before we knew it the storm clouds were back and looking much more threatening. It started to snow lightly and spindrift avalanches shot off the top of the headwall above us. The climbing was hard and we had no idea where we were. On a small ledge Jason and I talked about our options and concluded that rappelling would be too dangerous with the new snow loading the steep slopes above. Besides, we didn’t have much gear to leave for rappels. Out left we saw a ledge system that crossed the face to a ridge, where we could escape to the descent glacier. We traversed some of the weirdest, scariest snow climbing we’d ever done, with very little protection and huge snow mushrooms, until finally reaching the ridge and then the glacier. We were tired, hungry and dehydrated, and our feet were in pain from minor trench foot. The visibility quickly deteriorated. Before we knew it we couldn’t see five feet in front of us. The storm was getting worse, with increasing snowfall and wind. We sat down and endured the night. In the morning we were so cold that all we could do was jumping jacks to try to warm up. We returned to the Alberta Hut after three days on the go and nearly no sleep. At the hut we packed our bags in silence, lost in thought. There is something special about the suffering on a big alpine route that puts you in a very different mindset. I have never been so present and in the moment. The silence is beautiful on a mountain like North Twin. Back at my van four hours later we removed our boots, put on dry clothes and bumped Outkast as loud as it would go. Jason and I had gotten what we came for – our version of Life. Hayden climbed his first multi-pitch climb, the Kor-Ingalls route on Castleton Tower, when he was 13. He was petrified the entire day. Rather than deter him, the experience solidified his climbing obsession. Today Hayden works toward the goal of mastery in all aspects of climbing. He finds inspiration from the struggle of a hard redpoint or the mental challenge of a dicey alpine lead.